The far north-west of Scotland had so far eluded me. Assynt, in particular, with the majestic hulk of Suilven rising proudly amongst a patchwork of lochs was a place I’d long since dreamt of exploring. 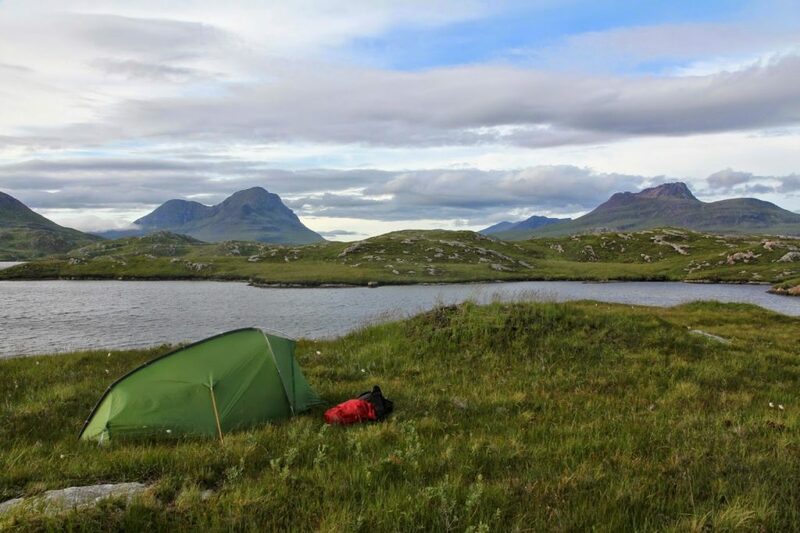 Last summer, after having just purchased a Z-Pro Flash FL200 inflatable canoe I hatched a plan to spend a week exploring NW Scotland and visiting Assynt. 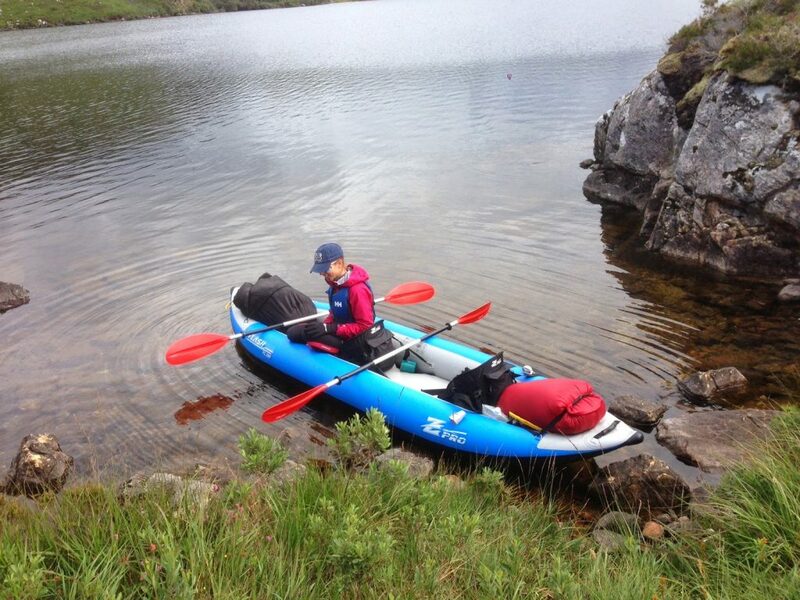 Part touring, part exploring, the plan was use inflatable canoe as a new means of exploring and a quick glance at maps and web-research showed that Loch Sionascaig and Loch Veyatie were obvious options, the former having a number of small islands and also access to Stac Pollaidh and Suilven. There is no direct access to Loch Scionascaig, the easiest access with a short canoe portage is via Loch Buinne Moire just off the road south of Lochinver. The other option being from the east heading up Loch Veyatie, into Fionn Loch and then heading overland into Loch Veyatie. This would involve a fair portage and with an inflatable weighing 17kg it was not a realistic prospect. A full days drive meant we arrived in Aviemore at 6pm on a Friday evening were somewhat surprised to find every campsite full due to a biking festival. After trying several sites we managed to persuade one campsite to allow us on the last available caravan pitch. 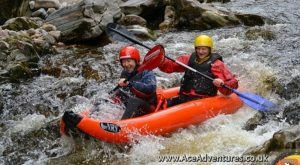 We’d booked an intro white-water instruction course with Ace Adventures on the Saturday and spent an enjoyable couple hours working our way along the River Findhorn in an inflatable canoe, learning the basics of reading the water, negotiating rapids and practicing crabbing. It was over all to quickly and with Aviemore already behind us we decided to head north taking the A838 – which must rank as the longest single track road in Britain – following the shores of Loch Shin. The term ‘range anxiety’ is usually reserved for describing the fear of electric car owners being unable to find a charging point (an anxiety I would later come to appreciate having swapped the diesel for an electric BMW i3), but the distinct lack of service stations meant I was suffering my own range anxiety of a diesel kind. Nothing prepares you for the sheer enormity of the wilderness in Scotland, the expanse of landscape and the distances involved. Reaching the A82 on the north-west coast we continued to head north, rarely seeing another vehicle save for the odd camper-van with French or German number plates. Some three and a half hours later we arrived at Sango Bay, Durness on the north-west coast, just a few miles from Cape Wrath. It felt like we’d reached the end of the world – looking north the next piece of land would be the Arctic Circle. We entered the campsite and found a fabulous pitch perched on the cliff directly overlooking the bay and were greeted by the beautiful sight of crystal white sand and clear blue-green water. The view wouldn’t have looked out of place in the Caribbean! 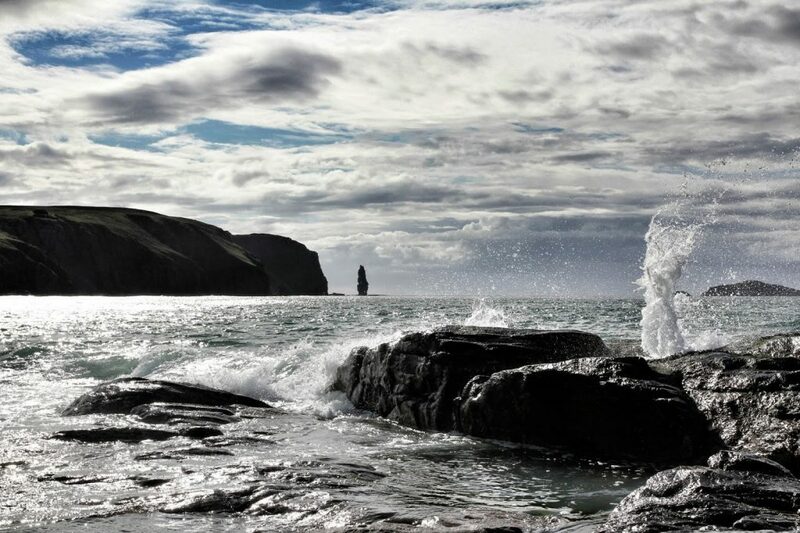 The next morning we explored Smoo Cave and Balnakeil Craft Village before heading a little further south. 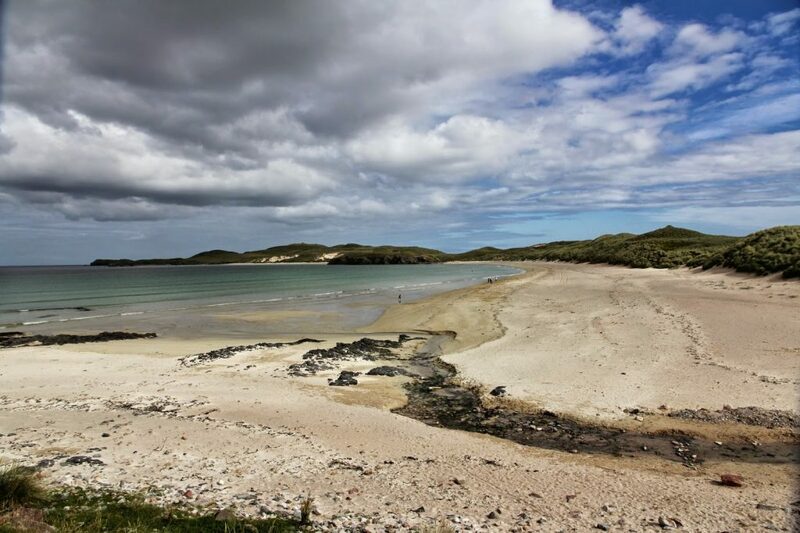 Sandwood Bay is reportedly the most remote beach in the UK, reachable only via four mile walk-in. Parking in the tiny hamlet of Blairmore we trudged north along a clear path with darkening skies and a strengthening breeze. Reaching the bay at around 4pm it was almost deserted – anyone else had clearly been blown away by the wind. 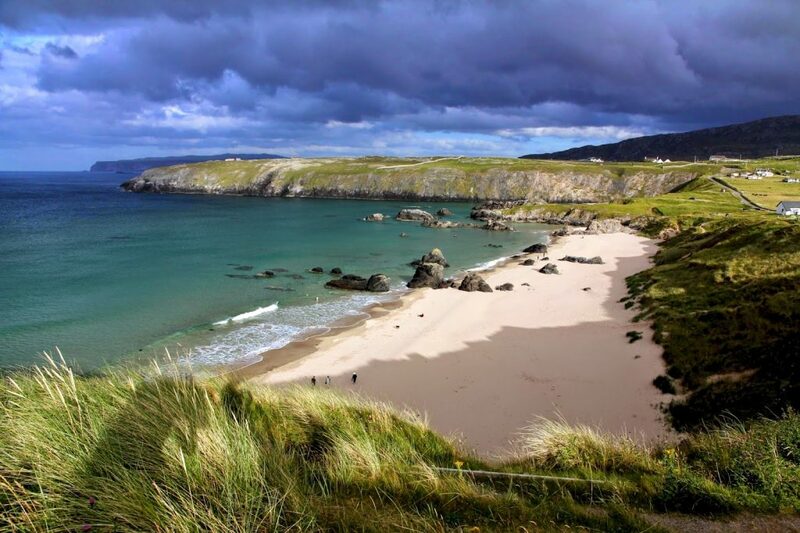 Sandwood Bay comprises a huge swathe of sand nestled between two headlands, the southern cliffs ending in the sea-stack of Am Buachaill, and a jumble of sand-dunes separating the sea from Sandwood Loch behind. After rock-hopping and taking some photos we decided to find respite from the breeze and find a camp-spot behind the dunes on the shore of Sandwood Loch. As the evening progressed the wind-dropped and the inevitable midges confined us to our tent while I scoured maps of Assynt trying to plot the next stage of our mini-adventure. The next morning we returned to the car and headed further south, veering off the A894 at Unapool to take the coastal route around to Lochinver. From there we would follow the single-track road that skirts the western edge of Assynt to check out the canoe access via by Loch Buine Moire. As we wound our way around we would periodically catch a glimpse of the unmistakable bulk of Suilven. We stopped in a small lay-by by Loch Buine Moire. It was smaller than expected and would likely take only a 10 minute paddle to cross and the small col over which we would then have to portage into Loch Sionascaig didn’t look too severe. Carryinh on I’d forgotten that we would pass underneath Stac Pollaidh, one of the most recognisable Scottish peaks. We headed back north on the A9 to check out access to Loch Veyatie but parking and access seemed less straighforward and the route would involve a long paddle straight into the wind. It was already mid-afternoon so we decided to head into Ullapool where we stayed the night in the town campsite before grabbing last minute provisions and heading back up to Loch Buine Moire the following morning. Parking in a small lay-by we lugged our rucksacks and canoe down to the waterside. I had that excited, slightly nervous feeling you get when you bid farewell to the car and an adventure begins. Ten minutes later the canoe was inflated and the rucksacks strapped fore and aft. It was only going to a short paddle across the loch, but as we pushed off I smiled as the adventure begun. We knew there was to be another portage to get across into Loch Sionascaig but were unsure of how long/high. Fortunately it was only 100m or so and didn’t involve anything to steep and two shuttles and a muddy scramble saw boat and gear sat on the shore of Boat Bay at the western end of Loch Sionascaig. The water was still in the sheltered bay but the ripples soon increased as we headed out into the main body of the loch. There are numerous small islands dotted throughout, the majority of which are largely inaccessible and are in no way flat enough to camp. Eilean Mor, by it’s name the largest, was the obvious destination and a known destination. Approaching from the west its rocky ramparts looked impregnable and only on reaching the far eastern tip was it evident where you could land and possibly camp. Once ashore our excitement was immediately tempered by the presence of five or six tents already in-situ. The island was already colonated! Judging from the large plastic storage barrels they were likely from an organised canoe tour. Also evident were the midges, by the million. We beat a hasty re-treat onto the water and as we departed we could see in the distance a trail of open canoes heading back towards their newly claimed home. In search of a camp for the evening we headed north and scouted the shoreline but struggled to see anything remotely flat. Eventually, out of desperation, we pulled up in a small sandy inlet and after a quick recce, found a spot that was relatively flat and on which the tussocks of heather were sparse enough for the tent. The rain started as we pitched but it didn’t deter the midges which were out in force. Marooned inside, we whiled away the evening, tucking into a delicious Expedition Foods curry and squishing midges one-by-one against the inner (don’t tell David as it was his tent we borrowed!). The next morning the sun was peeking out from the clouds. From our camp-spot Suilven was hidden from view so we decided to head up the ridge to get a better view, and hopefully check-out Loch Veyatie and Fionn Loch. The next thirty minutes reminded me how trekking in Scotland is far more tiring than anywhere else in the UK. Tussocks of grass, heather interspersed with hidden big conspire to disrupt any rhythm and make every step an effort. On reaching the ridge I was surprised that the lochs were still not visible. 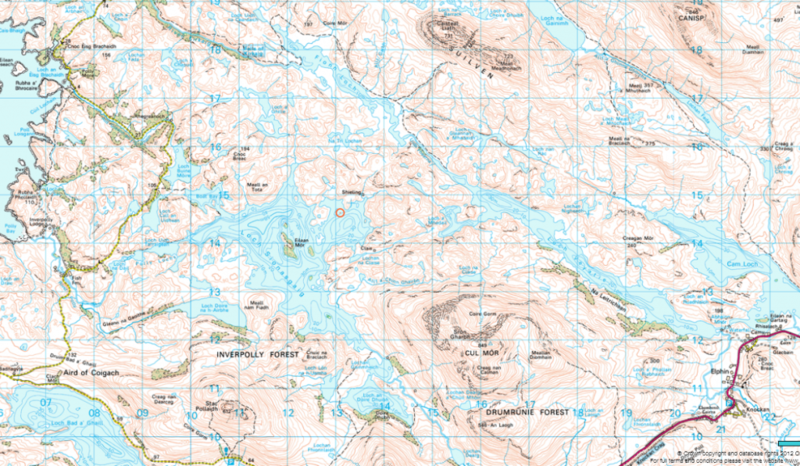 Whilst the map was clear in my mind I’d underestimated the scale of the topography. Suilven loomed large but from our vantage point appeared all but impregnable. Between clouds that rose periodically rose from nowhere to shroud the summit, binoculars offered an occasional glimpse of the steep route up to the central col. Behind us lay the peaks of Cul Mor and Cul Beag to the east, with Stac Pollaidh standing proudly to the south. Looking back down on Eilean Mor we spotted a trail of canoes departing so we guessed our island sanctuary had been vacated. We headed back down, quickly packed and paddled back across to the island to pitch our tent and stake our claim, before heading back onto the water to explore further. We eventually made shore on the south of the loch and deciding to head up Stac Pollaidh. Again the heather-bashing and bog-hopping impeded progress but eventually, after one last steep slog, the summit was ours and we could look back on the expanse of Assynt before us. And what a sight it was! After drinking in the views for an hour we descended back to our canoe and paddled back out to Eilean Mor to find the midges in full-force. Scouring around I found a few small pieces of broken branches and twigs and although damp I managed to light a small fire, hoping in vain that the smoke would deter the midges while we had dinner. T’was to no avail and despite the headnets I ended up covered in bites before another evening spent marooned in the tent. A heavy storm appeared from nowhere during the night. Lying awake my mind turned to thoughts of the canoe being blown away and us being stranded on the island, so around 2am I jumped up to bring the canoe further on shore, weighting it with rocks. The next morning it was calm and misty with a slow drizzle. Packing the canoe we pushed off to an eerie stillness to the loch. The water was jet black, almost like oil and suddenly we felt just a little vulnerable afloat on a deep dark loch. The mist lifted a little but it’s surprisingly difficult to pick out shore features when on the water and we missed the entrance to Boat Bay. A quick GPS check and we headed back north entering Boat Bay and landing with only a short portage and a 300m crossing of Loch Buine Moire to reach the car. 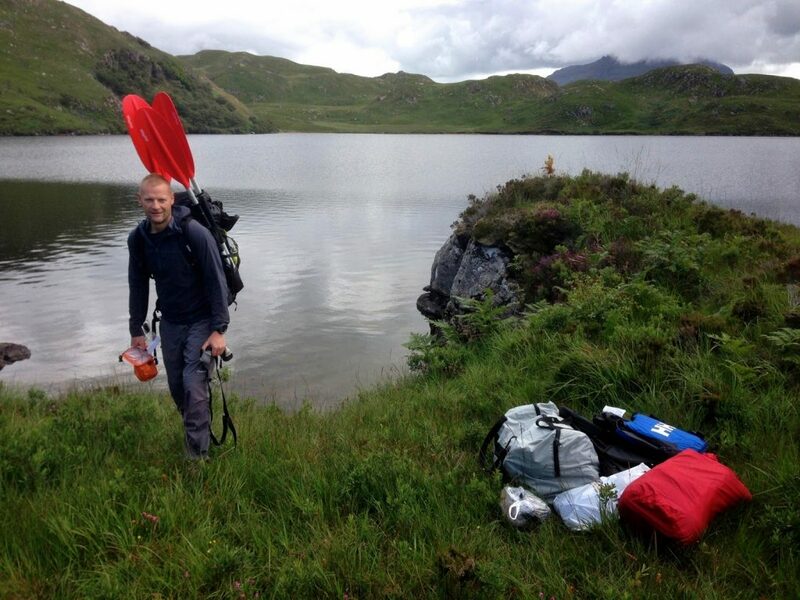 So we survived our first canoe-camping trip – a new adventure – and I’d scratched my Assynt itch! aside from the midge we’d had a great trip and the canoe added to the sense of adventure and exploration. I’m not sure it quite qualifies as a packrafting trip – the canoe stayed inflated and you wouldn’t want to lug 17kg very far, but it did open up a new dimension for exploring if you choose your route appropriately. Maybe it’s the first step on the road to a proper packraft such as an Alpacka raft. Weighing it around 2-3kg they are far more luggable. They aren’t cheap but if watch some of the online videos of people tackling serious white-water in them, then you can see how robust they are. There are some new lighter packrafts on the market, more suited to gentle river/loch crossings – the apaddleinmypack blog is a great resource if you want to investigate further. I have since purchased an Alpackaraft packraft which is circa 3kg and the size of a small 1-person tent when packed away. And for anyone considering a similar canoe/camp adventure I can recommend the Scottish Canoe Touring guide book as a useful start point. Nigel looks like a good trip in a fantastic area – one of my favourites. When Mary my wife is back to fitness with her shoulder, we have promised ourselves to do a canoe camping trip in the area. I have the Scottish Canoe Touring guide – good book that. Cheers Mark. Lots of options up that way including sea/coastal touring . 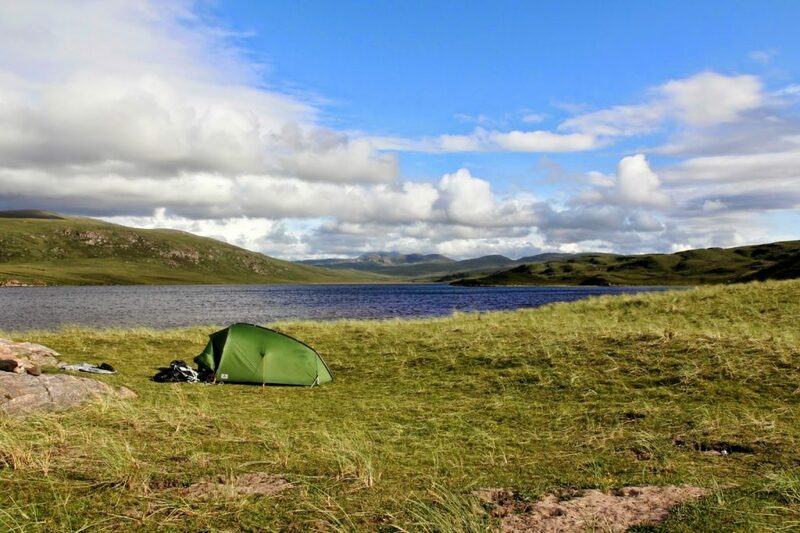 We're hoping to get up again this year – may be a little later in the season to avoid those pesky midges! Thanks Dave. I've kept up with your packrafting exploits through your blog and which definitely helped inspire our trip as well as further fuelling me aspiring to an Alpacka raft. Hope you don't mind that I've added your blog to my list on the right. Thank you for sharing useful information for the reading . I hope this article can be useful for us all. 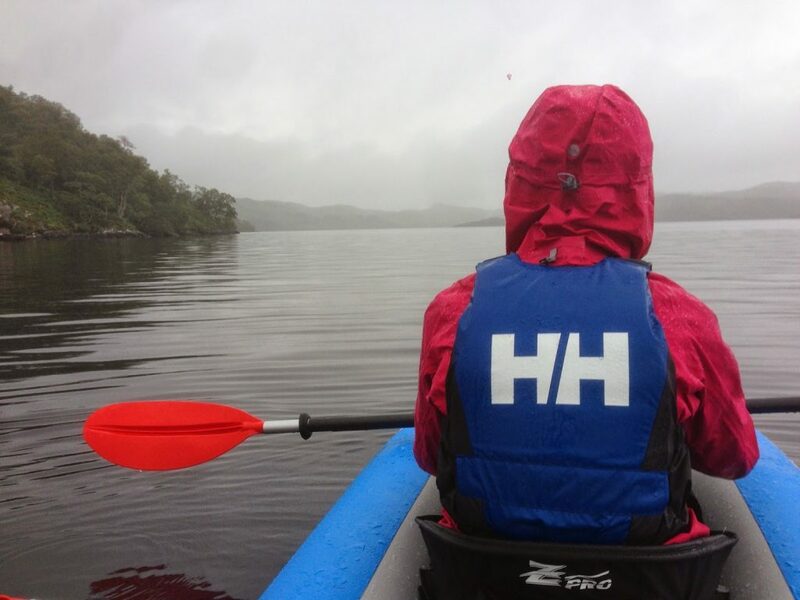 Thats really interesting I've just cam back from that area on our own canoe hike expedition except we started from Veyatie and did the overland portage in Scionasgaig we never thought about starting from Lochinver! 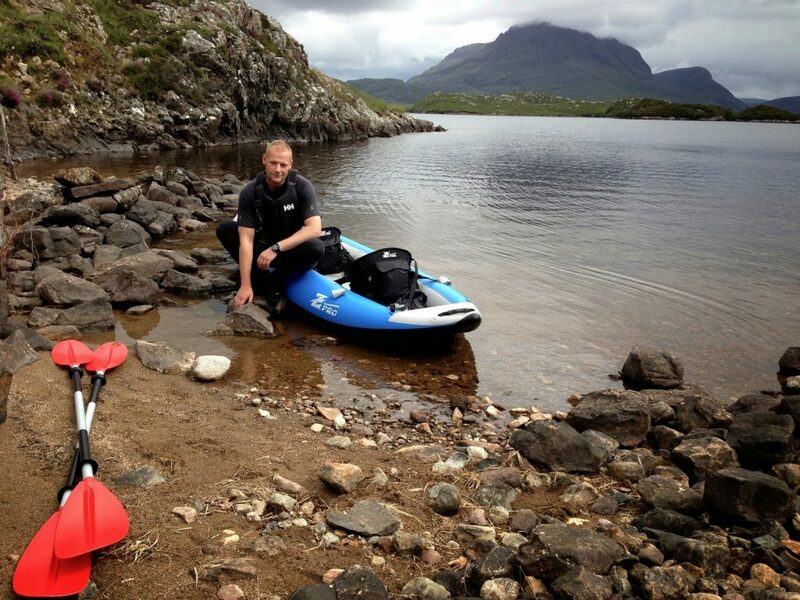 Here's my blog if you're interested for another adventure in the north west highlands!! Hi Cora, looks like you had a great adventure though from the photos it looks a bit colder than our trip! We chose our route avoid the portage but whichever route your choose it's a great area to explore! Quite fancy using a small inflatable Alpackaraft that can be rolled up in a rucksack, making portages a doddle! Yeah ours weren't pleasant a 15ft prospector canoe was not light!! We definitely want to go back it is such an amazing area even with the bit of snow we got but still it is so worthwhile to do.